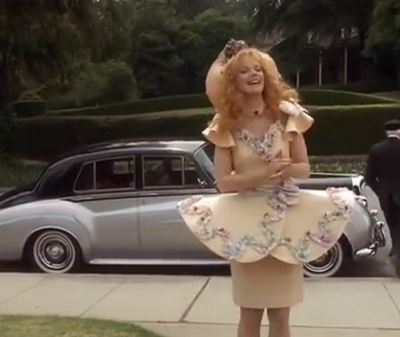 The opening sequence to 1989's Troop Beverly Hills, which follows the '80s cartoon craze previously seen at the start of such movies as Mannequin and Who's That Girl, is set to The Beach Boys song "Make it Big," an apt title considering that the film not only shows how troop leader Phyllis Nefler (Shelley Long) "makes it big" in the world of the Wilderness Girls, but also features fashion as ostentatious and outrageous as it could possibly get in the late '80s. 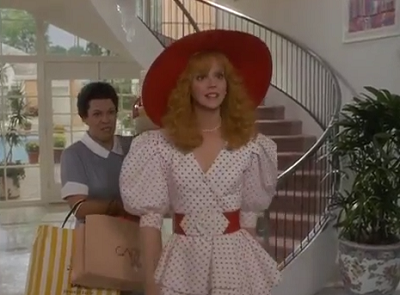 Before Donna Martin, it was Shelley Long who reigned supreme as the fashion queen of Beverly Hills. Who else could pull off a skirt that looked like a peach foldaway side table? 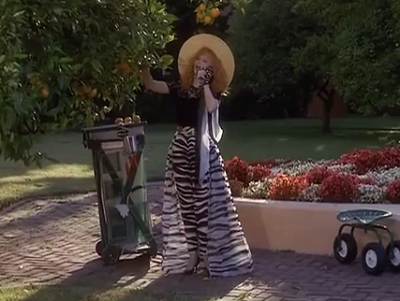 I'm sure her outfits inspired Lady Gaga in some way. 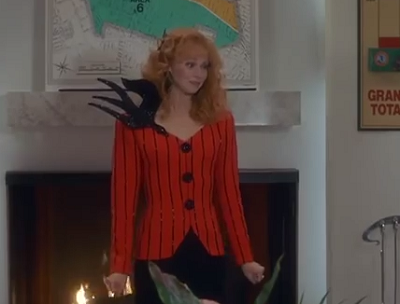 Hey, they may have even inspired a young Tori Spelling who was, in fact, in Troop Beverly Hills as a Red Feather sidekick. So let's take a look back at some of the best Wilderness Girl fashion patches earned by our fearless and fabulous troop leader. 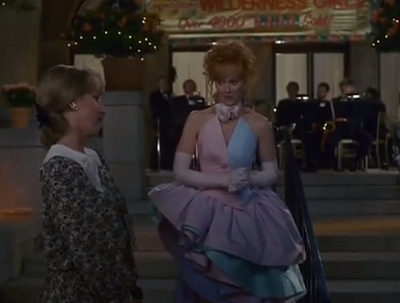 Phyllis wore this incredible ensemble to pay a visit to Henri and beg him to customize her Wilderness Girl uniform. I can't even imagine where she was headed to afterwards! The judgment passed down to the Theodora Van Runkle design Phyllis wore to the courthouse in relation to her divorce proceedings was glowing, with the judge declaring it "stunning." Sustained! I assume this showstopper at the cookie drive fashion show was one of Henri's Wilderness Girl uniform reinventions. The outfit epitomizes the troop's reasoning that "just because you're out in the woods, that's no excuse not to look your best. 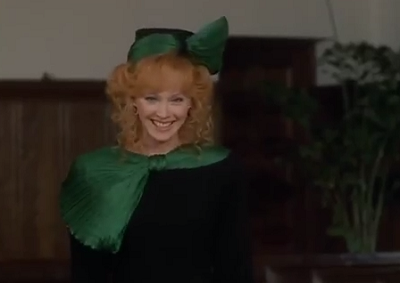 This outfit gets extra brownie points for a headpiece that can be flung off with a triumphant flourish after telling your nemesis that you just sold 4,732 boxes of cookies. Totally fierce. Phyllis means business. Sheer zebra print for light gardening work? Yes! Stephanie Beacham as the Jackie Collins-inspired character Vicki Sprantz earns an animal print patch too. 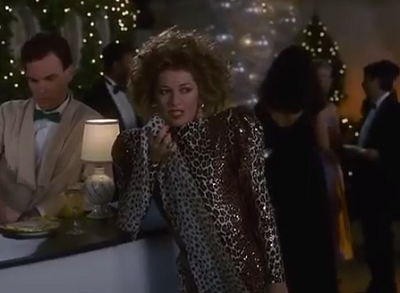 This is the dress that Phyllis wears when her estranged husband Freddy starts to see her in a new light, telling her that she looks "great... softer, somehow." 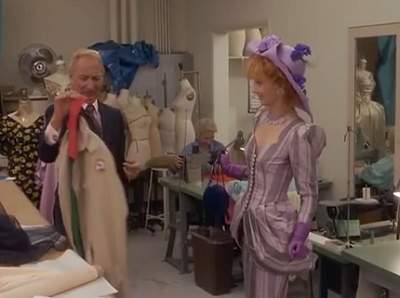 I love that this crazy creation is Phyllis's venture into "softer" territory. The power of pastels, eh?